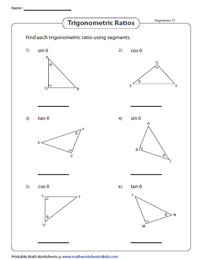 Practice these assortments of primary trigonometric ratio worksheets designed to benefit high school children with topics like finding trigonometric ratios using SOH-CAH-TOA; determine all the three primary trigonometric ratios of the right-angled triangle; find the value of sine, cosine and tangent; and more. 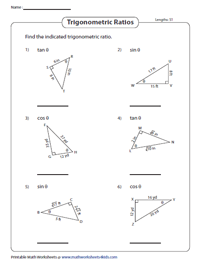 You can refer primary trigonometric ratio chart as an assist in solving these printable worksheets. 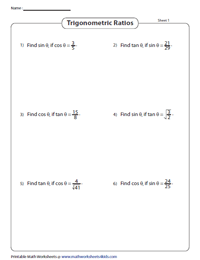 These worksheets require students to use SOH-CAH-TOA to find the trigonometric ratios sin θ, cos θ and tan θ. The sides of the right-angled triangle are given. Determine the value of the given trigonometric ratio. 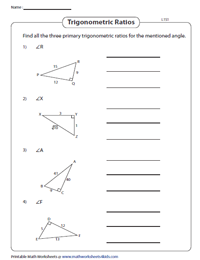 Worksheets are offered in both customary and metric units. All the three sides of a right-angled triangle are given. Find the value of sine, cosine and tangent for the specified angle. Apply Pythagorean theorem to determine the missing length of a right-angled triangle. 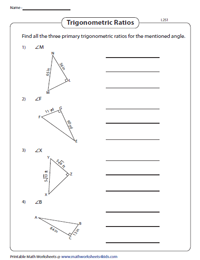 Find all the three primary trigonometric ratios using the information provided. Each problem contains a trigonometric ratio. Determine the value of the indicated trigonometric ratio. Ex: Find sin θ if cos θ = 3/5. Use calculator to determine the value of sine, cosine or tangent. 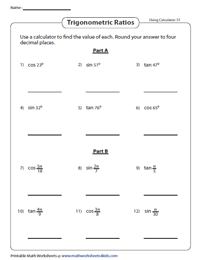 Each worksheet consists of two sections, Part-A and Part-B that offers problems in degrees and radians respectively. 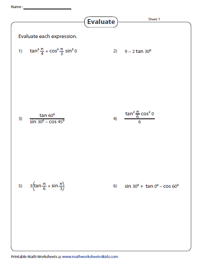 Evaluate the expression by identifying the values of the given trigonometric ratios. The angles are specified in degrees or radians.